Little is known about the cardiovascular effects of the transition from exercise in hypoxia (EH) to normoxia. This investigation aimed to assess hemodynamics during the metaboreflex elicited in normoxia after EH. Ten trained athletes (four females and six males, age 35.6 ± 8.4 years) completed a cardiopulmonary test to determine the workload at anaerobic threshold (AT). 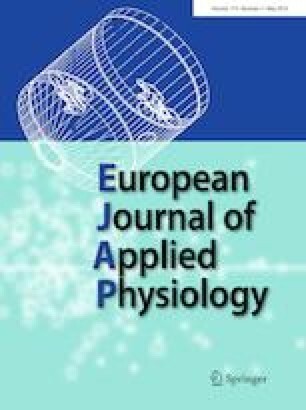 On separate days, participants performed three randomly assigned exercise sessions (10 min pedalling at 80% of AT): (1) one in normoxia (EN); (2) one in normobaric hypoxia with FiO2 15.5% (EH15.5%); and (3) one in normobaric hypoxia with FiO2 13.5% (EH13.5%). After each session, the following protocol was randomly assigned: either (1) post-exercise muscle ischemia after cycling for 3 min, to study the metaboreflex, or (2) a control exercise recovery (CER) session, without any metaboreflex stimulation. The main result were that both EH15.5% and EH13.5% impaired (p < 0.05) the ventricular filling rate response during the metaboreflex (− 18 ± 32 and − 20 ± 27 ml s−1), when compared to EN (+ 29 ± 32 ml s−1), thereby causing a reduction in stroke volume response (− 9.1 ± 3.2, − 10.6 ± 8.7, and + 5 ± 5.7 ml for EH15.5%, EH13.5% and EN test, respectively, p < 0.05). Moreover, systemic vascular resistance was increased after the EH15.5% and the EH13.5% in comparison with the EN test. These data demonstrate that moderate exercise in hypoxia impairs the capacity to enhance venous return during the metaboreflex stimulated in normoxia. Overall, there is a functional shift from a flow to vasoconstriction-mediated mechanism for maintaining the target blood pressure during the metaboreflex. Communicated by I. Mark Olfert. This study was supported by the University of Cagliari and the Italian Ministry of Scientific Research. GM, AD and AC: conceived and designed research, conducted experiments, analysed data, and wrote the manuscript. GS, SM, SR, GG, MM, and VP: conducted experiments and analysed data. SJW and GPM: conceived and designed research, analysed data, and wrote the manuscript. All the procedures performed in studies involving human participants were in accordance with the ethical standards of the institutional and/or national research committee and with the 1964 Helsinki Declaration and its later amendments or comparable ethical standards The study was approved by the ethics committee of the University of Cagliari.